Settled back in Manchester after an exhilarating few days in Barcelona…my first USk symposium and already my Facebook timeline is overflowing with fabulous drawings by my new USk friends. Beforehand I hadn't appreciated how emotional and rather overwhelmed I would feel after such an intense, vibrant and rewarding few days...it's been quite a come down, but at least it's as unseasonally warm in Manchester as in Barcelona! Must say a big thanks to my fabulous workshop tutors James Richards, Tia and Paul, Norberto, Marion and Luis. My work is now more confident, more expressive and I feel personally more interesting. I teach drawing at degree level to interior design students here in Manchester and it was such a privilege, for a change, to take a back seat and be directed! Personal highlight was 'Dynamic Ink - drawing with non waterproof ink' with Norberto Dorantes. Who knew a 1€ felt tip pen could be so liberating! Just loved the quick impact of this style of drawing - and as an added bonus got to properly catch up with the lovely Liz Steel who I have been in contact with online for a while now. So great, as with so many other people to put faces to names - and sketches!! 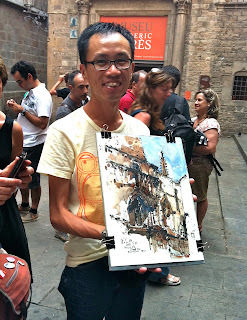 Also can't not mention Ch’ng Kiah Kiean's 'Sketching with Dry Twig and Chinese Ink' demonstration - just brilliant! Hard to summarise in a few words, but so many fabulous sketchers, so many interesting people - and from such diverse backgrounds. I expected the architects, landscape architects, graphic designers and illustrators etc, but hadn't banked on lawyers, accountants, microbiologists (to be fair I only met one of these! )...and of course from all round the world, did I hear 60 countries were represented? So then, how exciting to be part of such an eclectic but committed group of individuals all drawn together (sorry couldn't resist! 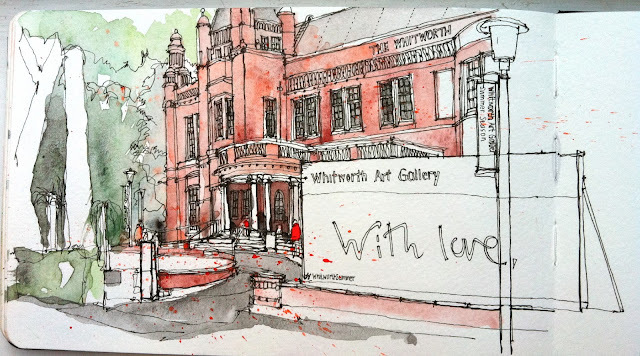 ), by our love of location drawing and sketching the world around us. Finally a very big thank you to Swasky and the team in Barcelona, we can't underestimate how much effort and hard work it took to organise such a seamless and memorable event. Congratulations to all involved. Like everyone else, can't wait to hear where it'll be held next year - but please count me in! Saturday's Sketchcrawl sketch (in between talking)! In the meantime I look forward to keeping in touch with all my USk new friends, have a great summer everyone. I'll finish with a couple of post bcnUSK2013 Manchester sketches...needless to say, if anyone finds themselves in Manchester (UK), please do get in touch. I love my city and am a good tour guide! 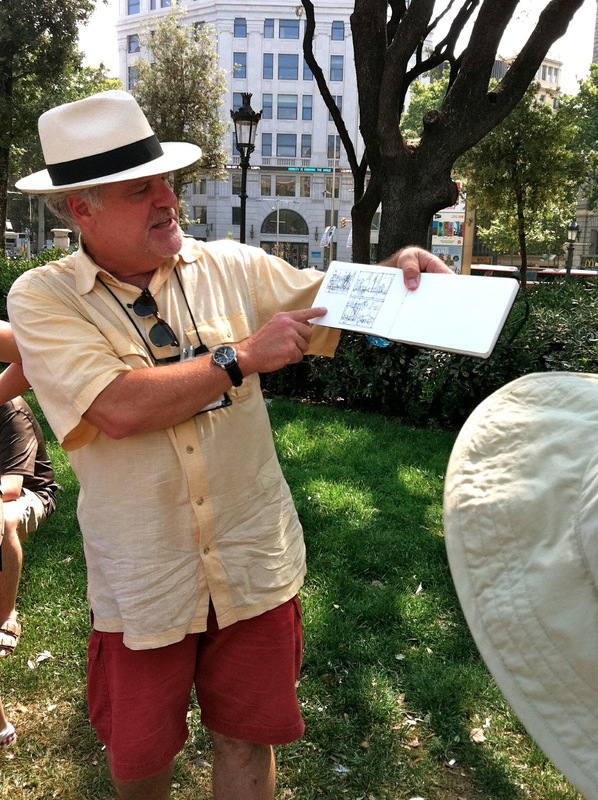 Until next time, happy urban sketching. Great post Simone and it was so lovely to meet you too. I loved seeing your work irl and seeing the influence of the various workshops. Looking forward to seeing what you do next !! Simone, I was so excited by our chance meeting at La Sagrada Familia, and honored that you came to my workshop. I have been and remain a BIG fan of your work, and look forward to continuing to be inspired by your posts. Wonderful post and wonderful sketches Simon. Great post and perfect summary of the experience! Love your sketches! Really love your sketches. Glad to have met you in Singapore! Hi all - thanks so much for your lovely and flattering comments, I'm really touched. Thought I could reply individually like on flickr but doesn't seem to be the case - so I'll reply on fb. Thanks again! Nice post and thanks for coming and enjoying! Great Post. I was so happy to meet you. I really love your drawings!